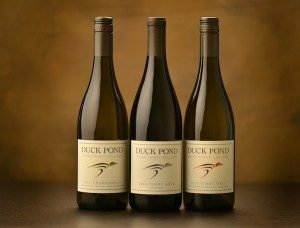 Despite its status as one of the larger wine producers in Oregon, Duck Pond Cellars remains small at heart and is a family-owned winery through and through. Originally from California’s Central Valley, lifelong farmers Doug and Jo Ann Fries moved their young family to the small Central Oregon town of Sunriver in the early 1980s. In 1984, they purchased property along the banks of the Willamette River in Dundee, Oregon, where they planted a 500-acre hazelnut orchard. In 1990 son Greg Fries began college at UC Davis with the intent to study agribusiness. An elective course in enology sparked a new interest, though, and he changed his focus to learn the art and skills of winemaking. As daughter Lisa neared her own college graduation, the four family members crafted a plan to begin their own small winery in Dundee. On Memorial Day Weekend of 1993, Duck Pond Cellars opened its doors to the public for the first time, named in honor of the family home on Sunriver’s Duck Pond Lane. In the early to mid-90s, the family continued acquiring land throughout the Northwest that they felt would be suitable for vineyards. Wishing to try their hand at warmer-climate varietals, they purchased a large parcel on Eastern Washington’s Wahluke Slope where they planted a wide variety of grapes including Chardonnay, Cabernet Sauvignon, Merlot, and Syrah. Dubbed Desert Wind Vineyard, the vineyard has supplied fruit for Duck Pond wines, as well as the family’s Washington State brand, Desert Wind, launched in 2001 to showcase the exceptional fruit from the vineyard. Their most recent purchase was a large plot of land in Southern Oregon’s Umpqua Valley, which they call Coles Valley Vineyard. Formerly in pasture, the acreage was planted to a variety of Pinot Noir clones between 2009 and 2012. The cuttings for the vineyard were hand-grafted and readied for planting in four greenhouses on the Hylo Vineyard. 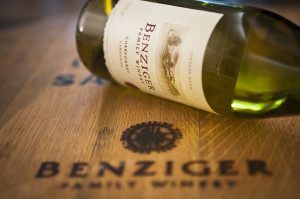 Benziger Wines are about three things: family, great wine and healthy vineyards. For more than thirty years they have searched Sonoma County for the most distinctive and expressive vineyard sites. Once found, they tend theirSonoma winery using certified Biodynamic, organic and sustainable farming methods. The result is a portfolio of authentic and memorable wines. Cuvaison Estate Wines is a family-owned Napa Valley estate vintner. 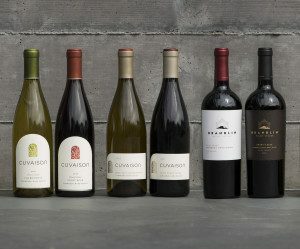 We strive to consistently produce ultra-premium, hand-crafted wines that reflect the finest attributes of each vintage and capture the uniqueness of our two estates, Carneros for Cuvaison and Mount Veeder for Brandlin. Established in 1969, Cuvaison produces Chardonnay and Pinot Noir grown exclusively on its estate vineyard in the heart of the world-renown region of Carneros in Napa Valley. Cooled by fog from the San Pablo Bay, the rolling hills of this certified sustainable estate has produced distinctive Chardonnay and Pinot Noir for 35 years. Dedicated to a philosophy of producing vineyard-driven wines, Cuvaison employs block by block farming methods and a hand-crafted vineyard-to-bottle winemaking approach. 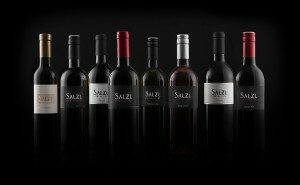 The resulting wines are balanced and complex, showcasing the distinctive characteristics of this cool climate estate. Brandlin is a Napa Valley estate that produces wine from a small, historic vineyard in the Mount Veeder appellation. Overlooking Napa Valley from its 1,200 foot perch, the estate is planted to 38 acres of Bordeaux varieties. These sustainably farmed, low yielding vines produce intensely concentrated grapes, resulting in wines that eloquently express this rare and rugged mountain site. The wines pay homage to the Brandlin family, which began farming wine grapes on Mount Veeder in the 1870’s and established the Brandlin Vineyard in 1926. In 1998 Cuvaison Estate Wines was honored by the Brandlin family with rights to purchase Brandlin Vineyard. Today, we remain dedicated to maintaining the original ten acres of old vine Zinfandel and continuing the family’s tradition of nurturing and farming the vineyard by hand. Winery Salzl Seewinkelhof is situated in Illmitz among the lakes and lowlands of the National park Neusiedlersee-Seewinkel in Austria’s most eastern state called Burgenland. Typically for this region are the endless seeming lowlands with its lakes and varnishes. Well-balanced, harmonic and without edges that is how the region and also the character of the wines are presenting themselves. In favor of the climatic assets of our region we produce self-contained, fruity wines which are reflecting the terroir of our vineyards. The distinctive silence and wideness of the lowland finds its expression in the softness of our wines. The winery got managed as a family business for decades. Today three generations are working side by side at the winery. Everyone that works in our winery shares the ambition to develop quality to the maximum. Situated in one of the world’s most benefited regions for winegrowing we are able to produce red, white and sweet wines in an outstanding quality. 75% of our whole production is red wine. Our most important grape is Zweigelt, able to grow and ripe to unique character and brilliant quality.